Excerpt from Sidney Coleman's Erice lectures. The period he describes just predates my entry into physics. This was a great time to be a high-energy theorist, the period of the famous triumph of quantum field theory. And what a triumph it was, in the old sense of the word: a glorious victory parade, full of wonderful things brought back from far places to make the spectator gasp with awe and laugh with joy. I hope some of that awe and joy has been captured here. Physics students learn quantum mechanics and special relativity as undergraduates, but typically do not encounter a synthesis of the two until graduate school, in a course on quantum field theory. Undergraduate quantum mechanics focuses on non-relativistic particles, moving at much less than the speed of light (e.g., the electrons in atomic systems or ordinary matter). Special relativity, as first encountered by students, is a modification of Newtonian (classical) mechanics, and ignores quantum effects. In quantum field theory (QFT), the wave function of quantum mechanics Ψ(x) becomes a wave functional Ψ[ Φ(x) ], valued over field configurations Φ(x) which are themselves functions of spacetime coordinates. Individual particles are excitations ("quanta") of quantum fields. I think it is fair to say that almost no student really gets a deep understanding of quantum field theory when they take it for the first time. It is simply too complex to digest quickly. QFT introduces new intuitive pictures, novel calculational tricks, strange physical and mathematical constructs. And how could it be otherwise? All of these tools are necessary to make sense of the generalization of ordinary quantum mechanics (of a finite number of degrees of freedom) to a physical system with an infinite number of degrees of freedom. I first took quantum field theory (Physics 205) in my last year at Caltech, taught by Fredrik Zachariasen. Zachariasen used Bjorken and Drell I and II and Ramond as the main textbooks. He was what Russian theorists sometimes refer to as a "strong calculator" -- he would fill the blackboard with equations as fast as we could note them down. However, I would say his approach to the subject was rather old-fashioned by that time, and while I learned a good bit about the Dirac equation, spinors, how to compute Feynman diagrams, and even about path integrals, my overall understanding of the subject was still lacking. If I had been there the following year I would have enjoyed John Preskill's version of 205 (see below), but alas I was already in graduate school by then. 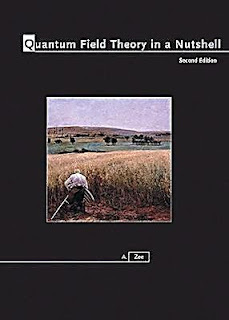 I remember that I also studied Feynman's short volume (in the Frontiers in Physics series; not to be confused with his later popular book) Quantum Electrodynamics. I was very confused at the time about the relationship between particles and fields and about so-called Second Quantization. Also, what happened to the Schrodinger equation? At no point did Zachariasen (nor, I think, do Bjorken and Drell) clarify that while Dirac deduced his equation via relativistic generalization of Schrodinger's, the two are not on the same logical footing. It was only some years later that I realized that Feynman himself had been confused about these things when he wrote his early papers on the subject. (Feynman, when someone explained a creation operator and Fock space to him: "How can you create an electron? It disagrees with conservation of charge!") Do Feynman diagrams describe spacetime trajectories of particles? Or are they simply graphical representations of terms in a perturbative expansion that happen to correspond, intuitively but not exactly, to physical processes? As a first year graduate student at Berkeley I took Physics 230 from Stanley Mandelstam, a true master of the subject. This course was far more theoretical than the one I had taken the previous year. Amazingly, Stanley taught without notes. The only day he brought a single page of paper to class was when he covered the BPHZ proof of renormalizability. (Or was it the day he derived the beta function for non-Abelian gauge theories? I might be conflating two different instances.) His lectures followed no specific textbook, although the recommended one was probably Itzykson and Zuber. My final student encounter with a QFT course was as the grader for Physics 230, taught by Martin Halpern. (I am sad to discover, in finding this link, that Marty passed away earlier this year.) Marty was a high strung chain smoker, and I recall many hours in his office going over solutions to his homework problems. He was especially on edge that fall because Vaughan Jones from the math department (who was about to share the Fields Medal with Ed Witten!) had decided to learn QFT and was sitting in on the class. As might be expected, the mathematician's insistence on clarity and precision slowed Marty down significantly. This wasn't Marty's fault -- QFT has not, even today, been placed on a completely rigorous footing (at least, not to the satisfaction of mathematicians), even though it is (in the form of Quantum Electrodynamics and the Standard Model) the most precisely tested theoretical construct in science. This post is long enough. 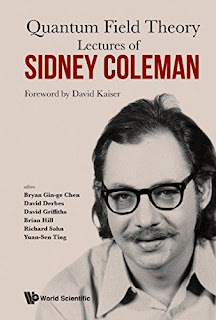 Perhaps I will revisit the topic in the future with a discussion of Sidney Coleman's lectures on QFT at Harvard, where I went after graduate school. It's nice to see that these lectures have been rendered into a book by his former students. For many years one could check out videotapes (Sony Betamax!) of his lectures from the physics library at Harvard. This made me think, even then, that the future of many professors might someday be as glorified teaching assistants, helping to explain and clarify recorded or streamed lectures by the true masters. If I have kindled your interest in the subject, I recommend my friend Tony Zee's book: Quantum Field Theory in a Nutshell. Also, John Preskill's fantastic lecture notes, covering basic as well as advanced topics. It took me some time to learn to decipher his handwriting, but it was worth it!